In 2009, we introduced the pinnacle of SHISEIDO skincare. A combination of traditional Japanese aesthetics, breakthrough technology, and ancient botanical wonders – a premium skincare line born of our passion and dedication for beauty that transcends time. These two words say so much more than just two words. They capture grace and confidence. They inspire poise and dignity and breathlessness. These two words write poems and music and tell stories that endure the test of time. And for the past ten years, Timeless Beauty has been the heart and soul of Future Solution LX. The Japanese aesthetic was born over a thousand years ago. A time when Kyoto was not only the capital city, it was the center of politics and art. A time and place that make Japan what it is today. Back then, beauty was defined by intelligence and sophistication rather than looks. Speaking from behind a bamboo blind, a woman was judged by the beautiful color combinations of her layered kimono and the poetry she had written. A waka is a thirty-one-syllable poem. An expression of emotion and aesthetic that cherishes the mystery of nature and explores the human condition. A thousand-year-old artform, passed down for generations. As we search for meaning in our billion-year-old universe, trying to understand the miracle of the Earth, we find the answers in our emotions. We learn the eternity that exists in nature. We are stirred by the subtleties of its beauty. The truths that move us have always moved us. The waka above is by poet Onono Komachi. Written late in life, it expresses her deepest emotions and compares herself to a cherry blossom past its prime. Her self-reflection and humility represent her true beauty. A thousand years later, and without a single portrait in existence, people still refer to her as one of the most beautiful women in Japan – and her ancient waka remains true today. Change never rests. Technology advances, our connections grow, and what was fast today is even faster tomorrow. Yet, as the world changes, our time on it remains finite. And in our time here, we pursue the beauty that endures. Not the physical, superficial or ephemeral appearances, for these will fade. Beauty is found in intelligence. It is found in the pursuit of the world’s truths. And as time passes, its radiance grows from within. It will never fade. It is infinite. The world changes, but true beauty does not. Treasured for its substantial healing properties in ancient times, the Enmei herb’s roots run deep in Japanese folklore. According to legend, the herb was used by Kobo Daishi, the Buddhist monk of virtue, to save a sick traveler from death. Inspired by this, SHISEIDO’s researchers travelled to the sacred Mt. Koya in search of the plant. It was there that the master herb was handpicked and – following careful cultivation under laboratory conditions – exclusively formulated for Future Solution LX. SkingenecellEnmei is the product of a thousand years, but its wisdom transcends time. The Beauty Transcends Time Project celebrates the ten-year anniversary of Future Solution LX. An experience for the five senses, “Beauty Transcends Time” is an expression of timeless beauty. At the core of this project is a masterpiece called “Tokirara no Tebako” – an exclusive box containing Total Regenerating Cream and Total Protective Cream housed in special jars. It is intended to embody the worldview of Future Solution LX, and communicate our theme of “Beauty Transcends Time” to people around the world. Japan has a long-held cultural belief that a box can be more than functional. Some are said to contain mystical powers. The boxes used by aristocratic women were called “tamatebako.” They served as a personification of their beauty and intelligence, and were decorated like fine jewelry. Such boxes were often considered treasures, and many were dedicated to shrines so the gods could enjoy the contents for themselves. Tokirara no Tebako is a tamatebako. We believe that there is no better motif than tamatebako to communicate the mystique of transcendent beauty. And keeping with our theme of looking forward to the future, we believe the box itself is something that will be passed down to future generations. An authentic creation and a work of art. A cultural asset. In our collaboration between three great talents of intelligence, beauty and craftsmanship, this box represents our time and our beliefs. When the star and dew meet. You can hear the sound in your eyes. It transcends millennia and shines forever. An endless stream of understanding. This beautiful waka offers a mystic impression of a clear sound resonating faintly in an endless expanse of pitch-black universe, as if a ray of hope for the future. A sentiment of rich sensibility and profound intelligence that is worthy of being passed down through future generations. Drawing inspiration from Dr. Motoaki Shinohara’s poem, modern artist Yoshitaka Amano created an original maki-e composition (lacquer sprinkled in gold). 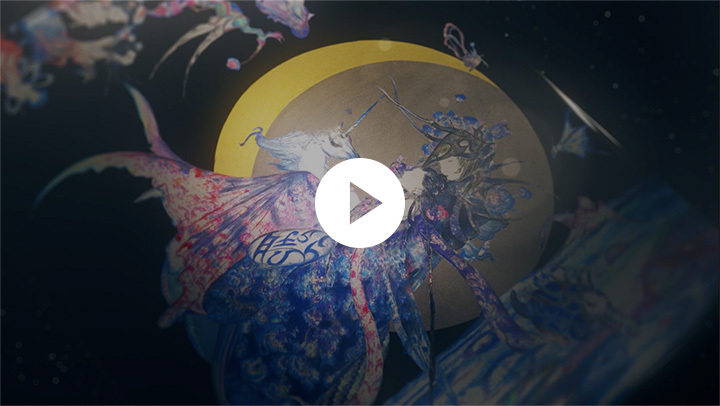 Yoshitaka Amano is renowned for his signature style: mystical, timeless, and inspired by traditional Japanese beauty. As an artist who represents our modern times, he is celebrated across a wide variety of mediums including painting, theater set design and book design. He is also known for his character designs in the “Final Fantasy” video game series. His one-of-a-kind artwork is a visual representation of words profoundly meaningful. Traditional Japanese craft has lasting power. Horyuji (Horyu Temple) in Nara Prefecture stands with the original wood from its construction 1,300 years ago. Tesuki washi, or handmade Japanese paper, has proven to last for more than 1,000 years. Perhaps most impressive, the lacquer craft made by applying layers of sap from the Urushi lacquer tree is said to last for 10,000 years. But the lacquer is also known for its artistic value. Its black color is said to have the highest purity of all black colors. The quiet tone absorbs light and is brought to life, like the depths of the sea where the sunlight does not reach. The technique of decorating the black lacquer with gold and silver powders is known as maki-e. Many elaborate and beautiful maki-e were created in the Heian Period (794–1185) and remain national treasures to this very day. Lacquerware truly embodies beauty that transcends time. Each Tokirara no Tebako is individually crafted by Zohiko – a traditional lacquerware manufacturer in Kyoto with over 350 years experience. In recreating the art of Yoshitaka Amano, their most accomplished and renowned master craftsman spends months to create each box. Inside Tokirara no Tebako, we use the most intricate fabric in the world. Nishijin textile is a traditional woven silk with a history of over 1,000 years in Kyoto. Its weaves are delicately nuanced with many different spatial layers, giving different impressions depending on the angle, radiating a mysterious glow. Kimonos made with Nishijin are often referred to as jewelry. The “mystical power that transcends time” embodied by our masterpiece is also expressed with Nishijin fabric inside the box. As a precursor of Beauty Transcends Time, Future Solution LX will also launch a special limited-edition product packaged in a Nishijin treasure pouch. It was created exclusively for this release, intended to express eternity through the motif of space. As a masterpiece of historical significance, we decided to present our tamatebako to a shrine. Under the protection of ancient Japanese gods, the box will be cherished and passed down to future generations. The dedication ceremony was held at Shimogamo Shrine, one of the oldest shrines in Kyoto and a UNESCO World Heritage Site. Following the ceremony, the tamatebako was handed over to the shrine and held in its Treasure House, where its artistic and cultural value will be protected for years to come, and its timeless beauty shared with the public at selected events.